I am so excited to share this quilt made by Debby. I completed Elephant Parade last year, for my grandson Charlie, he was just 2 at the time. He loves the mother and baby elephants and snuggles under the quilt. Even when it's hot, my daughter says he has to pull the quilt up as I have made it and it has cuddles from me in it! Makes my heart sing, yay! So enjoyed 'building' all the animals! Thanks for making your patterns available for so many to use. You do wonderful quilts and amazing talent! Awwww! My heart is so warmed by the story of her little grandson. Can't you just picture him getting tucked in at night and wanting to be snuggled up in the quilt his grandmother made just for him? Thanks so much for sharing your photos and story with us, Debby!!! 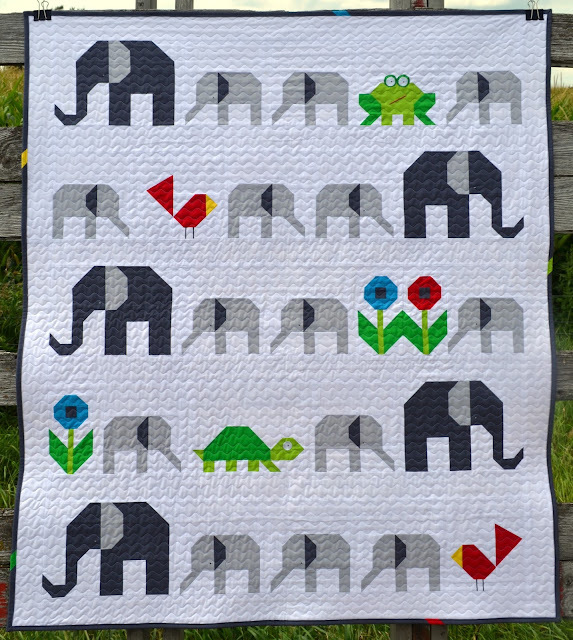 It was back in January of 2015 that I wrote about the first Elephant Parade quilt I made. You can read all about the process here in this post. I did remake the quilt because the first one sold in my Etsy shop. The Elephant Parade is a free quilt along that you can find here. This has been a very popular quilt along and I have had so much fun seeing so many versions made by those who have quilted along or taken a workshop with me. This pattern is also available as a convenient pdf download for sale in my shop here. Thank you for sharing this beautiful quilt and story, Lorna! I have yet to make this lovely quilt pattern, but it is this quilt that helped me 'find' your blog :)! Thank you also for your generosity in sharing so many free and wonderful quilt patterns with your readers. I really appreciate and treasure this!! I know that all that feedback has to be exciting for you... really adds extra meaning to what you do. Such a fun pattern! Such a great story! I am using your elephant blocks for the Rainbow Scrap Challenge this year. So at the end of the year, I'll have a parade of rainbow elephants! Thank you so much for sharing such a touching story, beautiful quilt and patterns and hosting this party! You are much appreciated!